When I look at "Storm" it has the same effect as some of the prophecies that I have read. I weep and bow down. "Storm is amaziing." 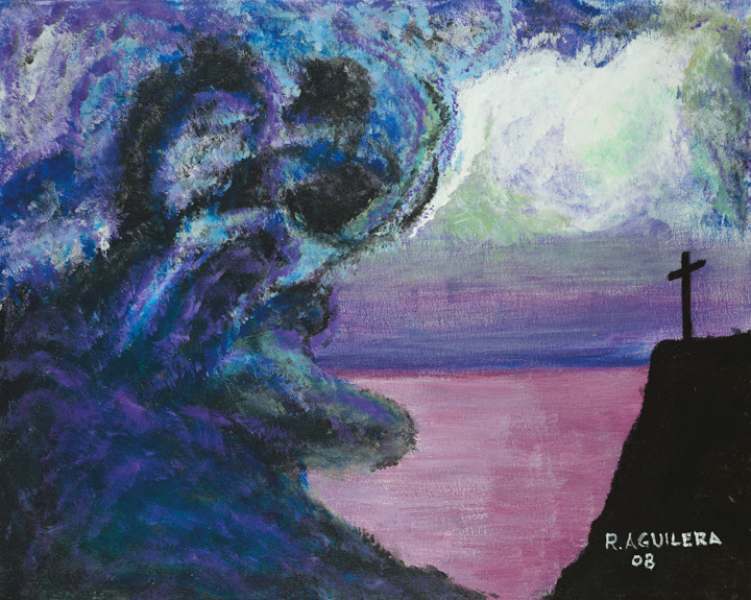 I think your painting "Storm" would be a good one to start with; I prayed about it and I felt the Lord did not object! Paper would be a good printing stock, I think. The print 'Storm' arrived today; thank you so much! It is even more beautiful in 'real life' than on the website. We are currently awaiting the remnant of Ike here in Arkansas. And we are praying for all those in S. Texas. I just thought that I would share some things related to my print "Storm." Firstly, the mailman left the box on my porch in the middle of a downpour. The box was soaking wet, so wet to the point that it collapsed in my hand when I picked it up. Additionally, there was a big hole torn at the top of the box, a really big tear. Guess what? My little "Storm" print was unharmed. Even though it was protected by plastic, it could have easily slipped out of the box or sustained some water damage. Secondly, I have had this giddy, peaceful feeling since I placed the print on my alter where I pray. So strange, I can't stop smiling since holding the print in my hands. Lastly, if you look at the side of the face with the big nose in the darkness, a semblance of "The Scream" jumps right out at you. "The Scream" is the skull-like creation with the open mouth created by some Scandinavian artist. I don't know, I don't know but 'something is definitely up' with these paintings. Things keep unfolding, but I will end here. Thanks again Ray, for ALL that you do and paint. I just received "The Storm" print from Ray and I must say it is so wonderful to see the strokes of the brush and have it up close! I can see a LOT of things that I could never make out online... it's really amazing! besides the obvious "face" of the storm cloud (which has eyes, nose, lips, and a big chin) there are other things that CLEARLY stand out - there is a little face at the top of the painting...a man with a big nose-clear as day... there is another figure that can only be described as demon... the area where the sun is, looks like an angel... and there is MORE. Of course these are only my observations- but I'm telling you, I can clearly point them out! (I'm not one to make more of something than what it is... but this is an amazing painting) I'm thinking He had Ray create EACH of these paintings JUST HOW HE WANTED THEM TO BE! Without Ray even knowing what He was doing! Every brush stroke! How cool is that?! This is a thought... don't know how to phrase this and perhaps it is completely WRONG...I'm just thinking that maybe each painting has it's own particular 'purpose'... I'm not saying that any one is better than the other, or more powerful... but I was thinking since they portray such different things, they might be made for different purposes some how... obviously the Lord KNEW who was going to get these prints/paintings, and how they were going to glorify Him... I think there is SO much MORE TO ALL OF THIS than the obvious. Thank you again, thank you for being so diligent. God Bless you now and forever and ever. funny thing, I have been thinking in exactly those same lines. I was thinking that maybe each painting that represents an individual spiritual matter, also brings its individual spiritual blessing to whoever receives it into his/her home (for example, one painting could bring wisdom, another patience, another the ability to fight spiritual strongholds etc.). Remember the ark of the covenant? Whoever received it in Israel (before it arrived where God wanted it to be) always received blessings with it. And on the other hand, whoever somehow broke against it ( like some gentiles during the time the ark was in their possession) were cursed by it. I don't know if this how it is with Ray's paintings, it's just a thought.